What a glorious time it is when it’s time to shop for new soccer cleats. Most if not of many of us are limited by our local store’s selection of consumer quality-level cleats. 9/10 what happens is you go to your local mall and find a brand outlet (Nike, Adidas, Puma, etc.). Shopping soccer cleats online isn’t as scary as many people think. Of course we get it though. How many times have you rushed to buy something in your local store only to realize you made a poor decision. 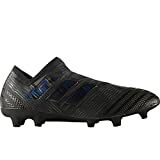 A little bit of research (reading reviews) could of easily helped you find a true to size soccer cleat perfect for your game. The idea of waiting 3-7 days for a product to arrive for some is downright excruciating. Let alone if it doesn’t fit the way you hoped it would (more common with low quality models). As a business, we understand that customers want their cleats right away. Just do yourself a favor and leave the microwave results on the burner and treat your next soccer cleat purchase like an important one. Upper Material: This cleat has Nike’s ACC (All conditions control) technology to help aid in wet and dry conditions. You won’t have to worry about the ball slipping off your cleat in rainy/icy conditions. On the inside of the Mercurial Superfly is anti-skid lining that helps keep your foot locked in and increase traction. Lace Pattern: Symmetrical lacing pattern. Stud Pattern: On all pairs of the Nike Mercurial Superflys you’ll notice a pattern of bladed studs. What’s unique is there is 2 bladed studs situated near the tip(toe) of the cleat. The benefit here is that you will get maxmium dig and with the combination of the bladed stud’s nature, you should be able to increase your over all speed/explosion. Sole Plate: The sole-plate is a feathery lightweight nylon that will take mold to the shape of your foot. This is ideal for balance as well with torque for use in combination with the bladed studs. It’s flexible, but durable and most importantly, light-weight. Overall: This cleat is great for speedy players. If you’re able to use skills at fast paces then you should be considering a Nike Mercurial for that reason alone. For players like you it only takes one little dip of the shoulder before you explode past your opponent or cut in to make a play. Style, first touch and control are all that the Nike Magistas embody. Add a bit of grace to your game when puttin on a pair of these elite level soccer cleats. Some of the soccer’s most famed midfield maestros sport the Magista Obras and rightfully so. This is the perfect cleat for your midfield General, Maestro and work horse. It’s note worthy to add that this is the exact model that professional footballer Mario Gotze wore when he scored the game winning goal in the 2014 world cup final in Rio De Janiero, Brazil. Upper Material: Like most of Nike’s best soccer cleats the Magsta Obra II has the All Conditions Control feature. Meaning the upper is made of a synthetic material that won’t sacrifice first touch regardless of the weather conditions. What makes the Obra II unique is the 3-D textured grooves that is concentrated in areas where our feet are likely to meet the ball. Nike’s Flyknit cables are also a noteable feature that will help secure your feet when lacing up making this an extremely responsive cleat for players who are constantly changing direction. Lace Pattern: This Magista Obra II come with a one-piece no tongue Flyknit upper. This forms into the the shoe to allow air to get into the cleat as well as to stretch and provide support. Since the cleat has no tongue you wont have to worry about it moving to the side or getting in uncomfortable areas. Stud Pattern: What’s pretty cool about the Magista Obra’s stud pattern is they are basically conical but in the toe area there is a circular patch of 3 bladed studs. The conical studs themselves are not quite full circles either. Instead, just before completing a full circle they flatten off (follow the link below to get a better idea). The though process here is that the cleats will be able to fulfill all the duties conical studs are famous for ( quick turns and pivots) while not neglecting the speed aspect of it all ( quick dig and explosion). Sole Plate: The sole plate is quite flexible and forms to your foot. It’s flexible, yet sturdy. Overall: This cleat cries for a midfielder/defender to come and put it on. It has all the qualities you need to be a technical player in technical positions. 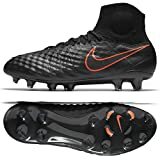 Ideally, if you’re looking for a soccer cleat that will help enhance your midfield game then you should be considering a Nike Magista Obra II or something very similar. Here we have a cleat that needs no promoting. The Adidas Messi Nemeziz 17+ 360 is a customary black version of the Adidas Nemeziz. Features are all the same, but it goes one step further being specifically designed for the magical feet of Lionel Messi. Success Gurus always say to imagine the person you want to become and you’ll become that. We’ll if you dream of playing like Messi then knowing what cleats are made for him is a good start. All jokes aside these Messi cleats have everything you’ll need to be decisive on the field. Upper Material: The Adidas Messi Nemeziz comes with the AgilityKnit 2.0 material. A few years ago Adidas came out with a laceless primeknit cleat and it was an instant hit. They’ve continued to modify the primeknit soccer cleat and now we have AgilityKnit. You’ll be able to control, pass and cleanly strike the ball since the cleat is self is laceless. The soft material lets you more accurately decide what you want to do with the ball. Lace Pattern: The Adidas Messi Nemeziz 17+360 is a laceless soccer cleat. No laces to get into your way and skew your shot. Stud Pattern: The stud pattern resembles is very similiar to the 17+ PUREAGILITY. There is a difference worth mentioning though and thats the TORSIONRIBS that play a role on the outsole which allows it to twist in a supportive and responsive manner. This aids immensely in changing directions. A good choice for players who want to enhance their agility. Sole Plate: The New TORSIONFRAME outsole, which was modeled after the 17+ PUREAGILITY. Overall: When arguably the best player in the world’s name is attached to a soccer cleat you can’t imagine it not packing quality. If you’re an agile player and you like to move about and annoy defenders then the Messi 17+ is a great cleat for you. The Nike Hypervenom Phantom III are cleats designed to increase your power, enable quick changes of direction and total ball control on the pitch. Upper Material: At first site you’ll immediately notice the hexagonal shape pattern going across the upper emphasizing as you get closer to the striking area. When striking the ball in this cleat you will experience a cushioned shot that won’t require much power. Also your striking endurance may increase in this cleat as well due to the hexagonal layers. Not only will they add a nice spin/knuckle effect, you’ll be able to strike the ball more effectively without tiring. The upper is made of Nike’s ACC technology so no matter the weather you’re all game. No slippage, no poor touch. Lace Pattern: The laces are as normal, but like most dynamic Nike cleats there is no tongue. This will make certain that the tongue of the cleat doesn’t interfer with your first-touch, passes or strikes. Also you won’t have to take focus off the game to realign your tongue since you don’t have one. One less thing to worry about on the pitch. Stud Pattern: Something truly unique with this cleat. Half of the studs are bladed and the other half are conical. Literally! You can draw a straight line down the middle of the cleat and see. What does this mean though? Well for fast pace cuts and explosions you’ll rely on bladed stud patterns. Should you need to get technical in a tight situation the conical studs are there to give you ultimate grip on the ball. This is a truly unique feature that you don’t commonly see on cleats. Sole Plate: The sole plate is durable and flexible. It does well to support your feet and is very responsive to game time play. Overall: The innovatitve FlyKnit material wraps around the cleat to offer maximum breathability. This is a super comfortable cleat and will be perfect for any position. If you want to enhance your shot, endurance and feel comfortable in cleats designed to do just that then try the Nike Hypervenom Phantom III dynamic fit. The Ace 17+ are the critically acclaimed godfather of the primeknit series. When recalling back to the mentioning of Primeknit uppers the Ace was the first fully featured cleat that comes to mind. Now with a whole series of primeknit cleats and colors the Adidas Ace 17+ represents all that is modern soccer. Upper Material: The upper of the Adidas Ace 17+ is made of the unique primeknit material that we all see too common now. Experience zero wear-in time and a much welcomed first-touch. The knitted material is covered in a thing film to keep out dust and debris from getting in. The overall support and comfort is what raised the bar on how soccer cleats should feel. Lace Pattern: The cleat itself is in fact laceless. The Ace has a PURECUT compression fit so you will feel nice and secure when putting on this cleat. All Ace 17+ come with a shoe horn to help you fit the cleat on properly as it’s important to maintaining the longevity of the cleat itself. Stud Pattern: Purely conical for the pure Middy. If your game relies on quick turns, pivots and other various techniques then the stud layout of the Ace 17+ would be welcoming to you. Sole Plate: You will immediately feel a difference in your overall support from the sole plate. It is extremely comfortable and allows you to feel dynamic when making cuts and turns. The plate itself is very responsive for quick reactions which is also an added benefit. 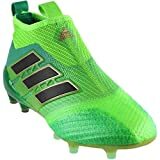 Overall: The Adidas Ace 17+ is a great soccer cleat that will soon (if it hasn’t already) set the standard for what every serious player should strive for. There’s a reason why players like Paul Pogba and Mesut Ozil use this very same cleat. It’s reliable, simple and modern. Most importantly it will enhance your game and you’ll notice the difference immediately when you get on the field. Your first-touch, shooting and passing will have a completely new feel to it (it’s a good too! ).